Premier League newcomers Swansea City completed their preparations with victory over Real Betis with Danny Graham sealing the win with his first goal for the club. 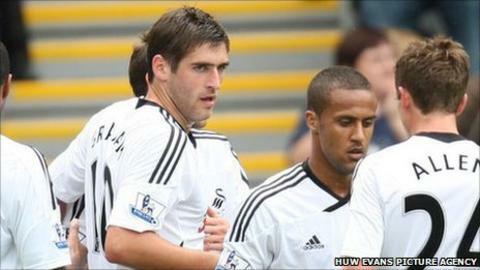 The Swans' £3.5m record signing turned superbly from an Angel Rangel ball to loft the ball in. Betis threatened through the pace of Ecuador's Jefferson Montero. But Brendan Rodgers' side dealt with that threat. Scott Sinclair was denied a great start after Stephen Dobbie found him only for Betis goalkeeper Casto Barriga to tip away the effort. Nathan Dyer and Rangel set up a chance from which Dobbie could have put the hosts into the lead, but he fired over. Good defending prevented Graham tapping home and the Swans were fortunate when keeper Jose Moreira recovered to stop the ball rolling over the line after he spilled Iriney Santos' shot. Moreira showed more suspect handling from a Sergio shot sand Casto tipped an Alan Tate header over on half-time. Portuguese keeper Moreira was replaced at the interval by German trialist Gerhard Tremmel and Wayne Routledge got his first outing since joining from Newcastle. Tremmel made two good saves from Jorge Vida and Graham's winner came in the 63rd minute as he turned brilliantly to chip over Casto.